Register Log In ECN Forum Forums Photos for General Discussion Are these "portable load centers" legal to code? I was at a video game convention recently and came across these portable "mega power strips", for lack of a better term. 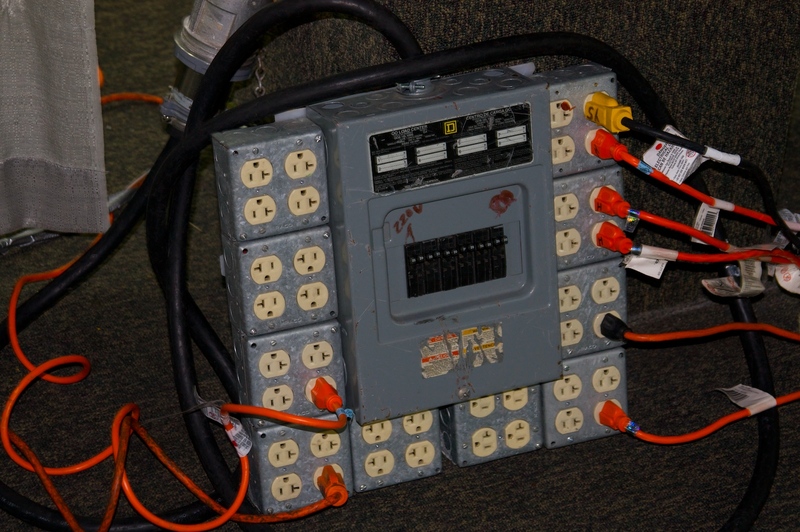 It looks like a subpanel with a bunch of outlet boxes attached, connected to a three-phase 120/208 outlet. I'm just wondering if these things are legal. I've seen many photos of "home-made power strips" that use outlet boxes derided in the violation forum, and got curious when I saw these being used to provide power at the convention center. The photo is attached; hopefully it comes through okay. Last edited by zorinlynx; 10/25/09 02:58 AM. Looks pretty dodgy; most production/expo companies would use spider-boxes or other purpose-built, UL-listed distro equipment. Boxes like that are subjected to a lot of physical abuse. Since these things are by default used in temporary power aplications, does the NEC even apply? Sure, and I've seen the rants against the extension cords with boxes mounted on the ends of them, with (at the minimum) the assertion that pendant rules apply. Balderdash! Since when did we make individual effort illegal? Maybe stick-built homes will be banned next, as there are many fine 'manufactured and UL-listed" homes available! Just because something is site-made does not mean it's automatically wrong. I applaud the guy's effort at making his own 'spider box.' Please note that most 'factory' boxes have far fewer receptacles, and use twist-lock types instead. This guy has the bases covered: support, over-current protection, strain relief, etc. While I might have done it differently, those are differences in design only. Let's face it: despite the tremendous range of products available commercially, there are still situations where the factory-,ade products are lacking. Perhaps the most obvious is the lack of space; plug in one 'wall wart,' and you've taken several receptacles out of service. That just might be why there are so many receptacles on this board. If - and it's a big if - one were to find fault with this product, it would be the lack of GFCI protection. That is an issue that can be readily addressed just by replacing a few receptacles. At the college where i used to work we made several of these,a bit more professional looking. We used 100A main breaker 3 ph. mounted to 2 wheel dollies. used them at all the various functions around campus,all GFI. We had various spots with 100 pin/sleeve rec to power them. This made function set up a snap. The NEC does cover temporary installations. From what I can see in the picture, there is only one fairly minor violation, disconnecting means are not labeled as to what receptacles they serve. I have one of these in my garage. I use for a disaster restoration company I work for. I use all the time as temp power after fires. Most fires do not damage the service so we are able to plug into the range with it and give them the power they need. Many time 5 or 6 dryers and fans. I have set it up so it can be madified to be used as a temp service. Have not had an inspector fail it yet. I think I would pull out 590 and 525 to see which applied to the subject installation ... if I was actually in a position to inspect it at all. Usually these things are just the source of some interesting pictures for a "building" inspector. The life safety officers or fire marshals may be able to step in but the building department is not involved unless there is a permit pulled. Not one GFCI. That is the problem I am having. Is it just sitting on the floor??? What is wrong with these folks?